This pattern has been updated to show more details on how to make the Catherine Wheel Stitch. You can do any color variation you like for the wheels. I used three colors for the alternating wheels of this blanket. To begin, chain a multiple of 8 plus 4 using a 5mm crochet hook. Then put 3 double crochets in the fourth chain from the hook. Skip three chains, and then single crochet in the next chain. Now skip three chains again and put 7 double crochets in the next chain. Repeat from * across. Because this is how the beginning row is done, if you're doing alternating colors then you'll want to change colors at this point. 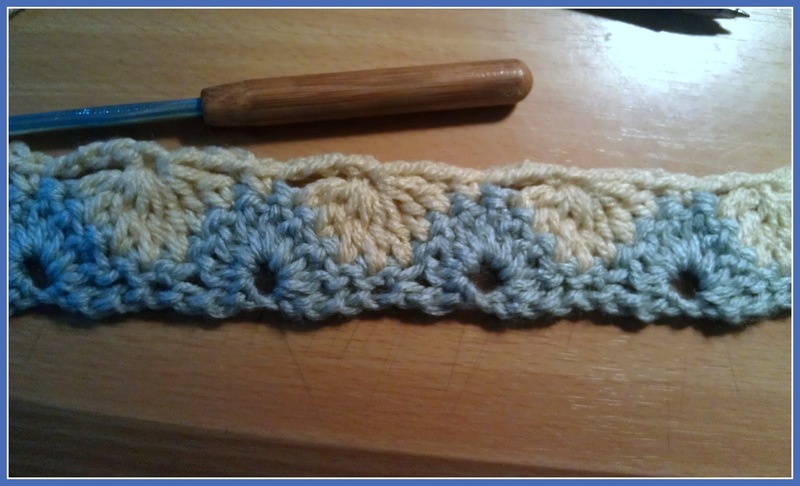 To change colors at the end of a row, leave the last double crochet uncompleted. 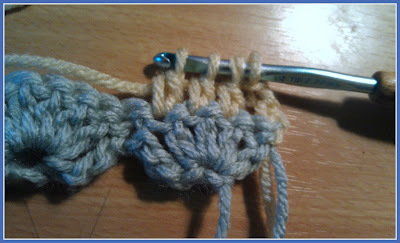 Then add the new color with the old color and pull a loop through the last two loops of the double crochet. When I add a new color to start a row, I like to chain one and then tighten the two strands of colors to secure the space. Then I chain the number needed to begin the row of stitches. For example with this pattern, I chained one after adding the new color and tightened it down. For row 2, start with a chain 3. 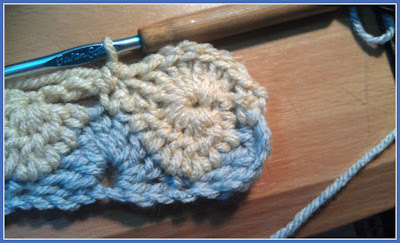 To make the bottom half of the wheels, you'll need to do double crochet 7 together. Yarn over, insert hook into next double crochet. Yarn over and pull up a loop then draw through two loops on the hook. 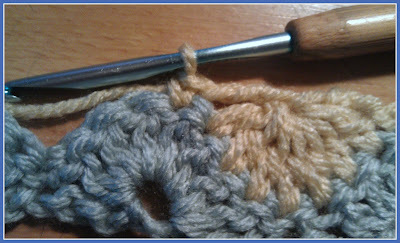 Don't complete the double crochet! Just repeat the process you just did using the very next double crochet, and again, don't complete the double crochet. Do this process a total of 7 times. I used an ink pen to show you where the two loops of each double crochet that I pulled through; the loops on the hook are the endings of the double crochets without completion. Now, you'll want to yarn over and pull a loop through all 8 loops on your hook. 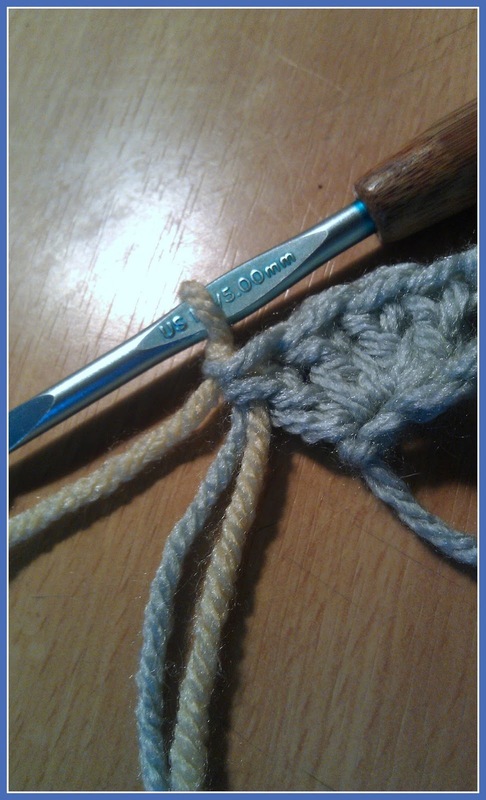 Next, chain three and single crochet in the next double crochet. Repeat the dc7tog across for the row. 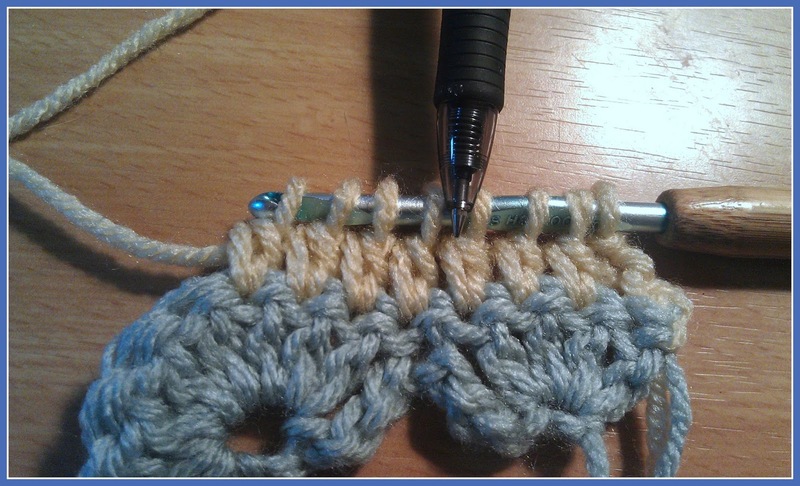 When you reach the end of the row, put a single crochet in the turning chain. Row 3 completes each of the wheels. 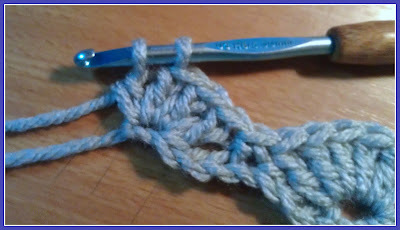 Chain one then put one single crochet in the first immediate single crochet. Now just put 7 double crochet in the ring of the cluster from below. Then single crochet in the next single crochet and the wheel is complete. Repeat the process across to complete the row. Gauge: One wheel is 2" across. Row 5: ch 3, 3 dc in 1st st, sc in next sc, *work 7 dc in center of 7dctog set, sc in next sc. Repeat from * across to remaining 2 sts. 4 dc in last dc. Repeat rows 2 through 5 to desired length. For the borders, I added one row of sc all the way around followed by a row of dc all the way around. Nice catch! That's a typo. It's supposed to only be "sk" for "skip". The e snuck in! Hi Shelly, How much yarn did you use for each color? Hey KnittingNewbie! I used 4 skeins of each color. I thought I had put that in here, guess not. Thanks for asking! Happy Hooking! 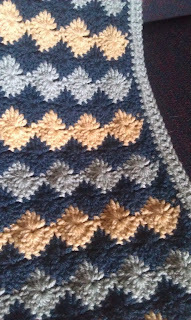 How would you determine the number of stitches to add to make this wider? This looks like a good blanket to use for Linus Project and they need to be at least 30" wide but I prefer 36". Thanks. Okay so I'm sure this is a dumb question, but how to do you the 7 dc tog? As you say in Row 2? 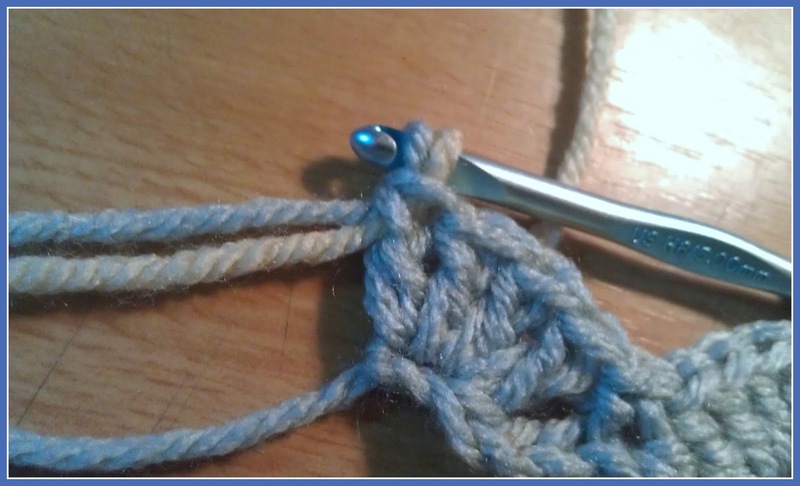 tog means together, when you do a double crochet, instead of pulling the yarn through the two loops on the hook to finish it off, YO (yarn over) and go through the next stitch, and again, don't pull through to finish, just pull through 2 loops then yarn over again and move to the next stitch again. As you do this, count the number of loops on your hook till you get to 7, then yarn over and pull through all of them. You've now connected the tops of 7 dc. Thank you for sharing this pattern! I made a lovely little scrap afghan for my two year old son using your pattern. I will link it to the ravelry page. The stitch and pattern are so beautiful I plan on making a full size afghan for myself later! Is this a multiple of 4 pattern repeat? 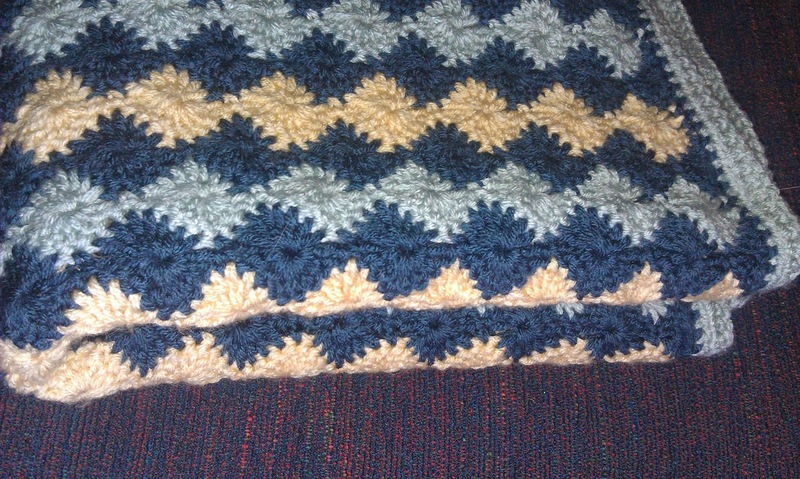 I want to make it a full size afghan, like about 60 inches. I'd like to make a bigger afghan. What is the multiples on this, please? I just have to say thank you! 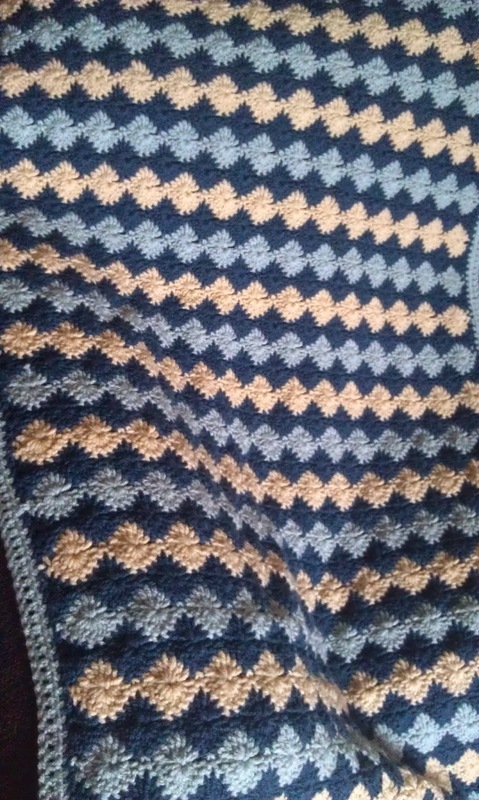 This was a great pattern to work with and I made the most amazing baby blanket for a friend who is near and dear to my heart. Thank you for this pattern! This is my first big project like this and I'm finding this very easy to follow! It's so pretty and I love making it! Hi great pattern btw. 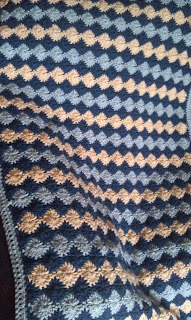 Can you use the sombre or the car on cake yarns for this blanket. I'm not sure but you could certainly do a few rows to see how it goes!